The two Trotter vets’ breakfast and lunch place on Diversey closed its doors to its Chicago patrons earlier this week, shocking many regulars. The sign out front that thanks customers for their business is a heartbreaking sight for many. The owners confirmed the news over the phone and gave out a statement. Gregory Ellis, the mastermind behind 2 sparrows originally started out as a graphic artist and marketing manager at CheckMaid. Graduating from Northern Illinois University, the star rated chef began his career as a designer but started feeling the ‘cubicle life’ didn’t sit well with him; getting nostalgic over the times he spent cooking with grandma, coupled with his inborn kitchen talents, he realized he wanted to pursue a path down the culinary lane and got a culinary degree from Elgin Community College. Interning at one of the finest restaurants in suburban Chicago, Ellis found his true passion in the restaurant industry, and went on to stage at the legendary Charlie Trotter’s. With his dogged determination to work for the world famous restaurant, Gregory Ellis completed all five stages deftly and became a full time chef at Trotter’s. Between 2004 and 2006, Ellis worked alongside reputed colleagues such as Matthias Merges, Giuseppe Tentori, and Bill Kim among others. He credits his time at Charlie Trotter’s for giving him the foundation to move forward as a chef, and that the quality of their ingredients and the precision involved in their preparation made an indelible impact on his cooking. Gregory moved to Tucson, Arizona and immediately joined as sous chef to James Beard Award winning Chef Janos Wilder at his fine dining restaurant and J Bar, a more informal setting. Moving back to Chicago in 2007, he worked for Pastoral, a European cheese and wine shop where he stayed till April 2011 when he left to open 2 Sparrows with his partner and old childhood friend, Steven Fladung. 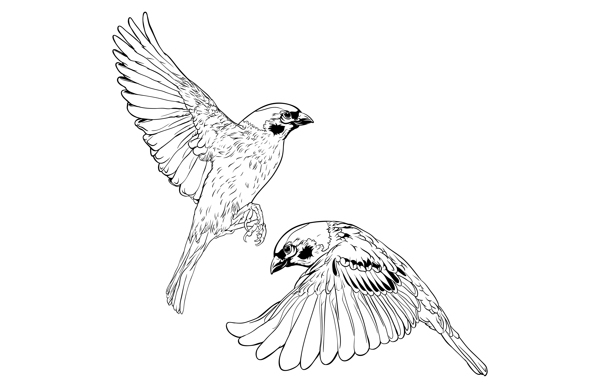 2 Sparrows derives its name from Greek mythology, where two sparrows pull the chariot of Aphrodite, goddess of love and agriculture. Featuring the contemporary American comfort food by Gregory Ellis and wine and beverages overseen by Steven Fladung, the two childhood friends celebrate their meals using ingredients and products from local famers and breweries. They continually transformed the menu, creating and evolving dishes and drinks for a dazzling array of brunch cocktails, beer pairings and of course, a coffee service to die for. LEED-certified Moss Design executed the 60-seat dining area, colored in earthy hues and red-orange tones. The restaurant is designed using reclaimed wood paneling, chandeliers, hip glass blown fixtures, tabletops and ever-rotating pieces all made by local Chicago artists. It goes without saying that patrons couldn’t get enough of Greg Ellis’ ever imaginative dishes. The home made pop tarts are a crowd favorite, as are the maple-bacon donuts. Savory sinful pleasures include their brunch item pork belly sandwich with a sunnyside-up egg and bread pudding French toast; Israeli cous cous and a grilled salmon salad with arugula, avocado and kalamata olives for lunch; roasted butternut squash, fancy grilled chicken sandwich with Brie and apples. Their seasonal cocktails and innovative spirits are not to be missed. Chef Greg Ellis’ outstanding collection of sweet and savory masterpieces reflects his formal training and fine dining techniques combined with locally sourced ingredients and products. He has long supported local farmers and businesses, celebrating fresh harvests and original untainted produce. 2 Sparrows has enjoyed a long and fulfilling patronage by Chicago food lovers. With its friendly service and remarkable food, this little café from heaven was loved and raved about equally by customers. Especially famed for its pop tarts, the restaurant never saw a slow night during its fruitful run. Even when the restaurant closed to renovate for a few weeks, people anticipated its re-opening with mouths watering all over Chicago.